FreeCharge as always, Offers great Cashback offers on Recharges & Bill payments. 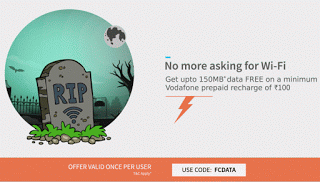 This time get 150 MB 3G Data ‘Absolutely Free’ on a minimum recharge of Rs.100 or above. This offer is only valid for Aircel, BSNL, Idea and Vodafone customers, Offer can be availed only once per user. 2. Sign up for a New FreeCharge account. 3. Initiate Recharge and Enter your Mobile Number. 4. Select Operator and Enter Amount 100 or more. 5. Select any desired Coupon from FreeCharge Deals for free Or Skip It. 7. Pay The required Amount using DC or CC and get reward recharge. Uncategorized free data pack, freecharge trick. permalink.